Janie Mines and her book "No Coincidences." Warning: This audio contains language that some listeners may find offensive. In 1976, Janie Mines became the first black woman to attend the U.S. Naval Academy. The Navy fought to keep her and other women out and once she arrived as part of the initial group of 81 women, many of her fellow midshipmen were furious that she was there. What was her life like for those four historic years in Annapolis? And as she changed the Naval Academy, how did it change her? 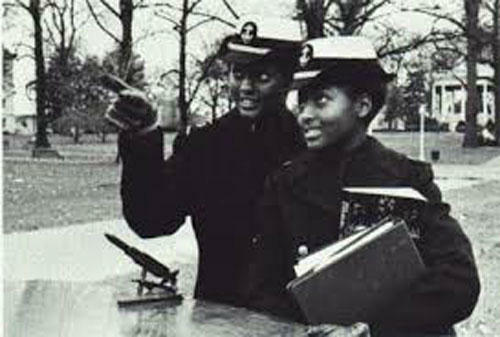 Janie Mines and her sister, Gwen, who followed her to the Naval Academy one year later. Mines has gone on to a long career in business management and consulting but until recently, she had never gone back and collected her thoughts about her time at the Naval Academy. Now, she has put those thoughts in a book called “No Coincidences,” which is about not just those key four years, but the life that prepared her for them. Let's keep the conversation going. Who do you want to hear from next on the SouthBound podcast? Submit your idea in the box below. You can also send a tweet to @tommytomlinson or @wfae, and email me at ttomlinson@wfae.org. The Jim Webb story from 1979 referenced in the episode, "Women Can't Fight"
SouthBound is a production of WFAE. Our host is Tommy Tomlinson. Our producer is Nick de la Canal. Our audience engagement manager is Joni Deutsch, and our main theme comes from Josh Turner. Chuck Reece wanted to hear a particular kind of voice from the South – a voice that loved and appreciated this part of the world while acknowledging all its faults, past and present. He didn’t hear that voice enough. James Scott is a young man who writes about old battles. He has published four books about critical moments in wartime, including three about World War II. RJ Young loved a woman. The woman loved her dad. Her dad loved guns. So RJ, who had spent his whole life staying away from guns, plunged headlong into the gun world.